Donald Trump may have gotten 4% of the vote in the District of Columbia, but in certain precincts over Memorial Day Weekend here in the Nation’s Capital, we’d bet his vote was higher. One can’t help but be moved by some of those who come each year, many by motorcycle, to celebrate Memorial Day. For everyone who comes for fellowship, a good ride, a fun weekend, there are others in possession of raw emotions, more than 40 years after the Vietnam War, and memories of their loved ones and earlier selves. We came upon this fellow sitting by himself, a few yards from the Wall. This ritual each year means a lot to our visitors who roll in from around the country. While some wait patiently for the Rolling Thunder motorcycles to come roaring by, others go into the pedestrian mall set up every year, to buy food and insignia, motorcycle gear, even holsters. And while few are still on active duty, some carry their rank with them wherever they go. While others carry the burden of their lives in the sadness of their eyes. 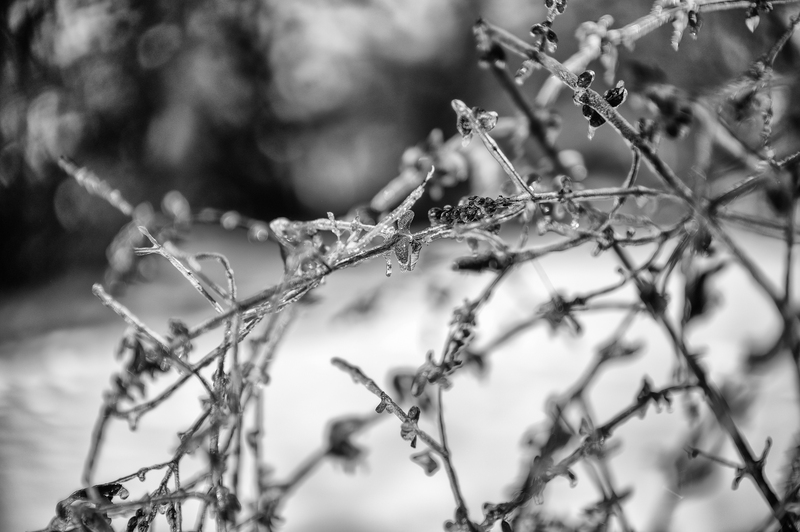 After the ice storm. Leica Monochrom, Noctilux, with ND filter. You are currently browsing the archives for the Leica Monochrom category.